A classic of the peony family, Peonies Flowers is a blast of fun. Colorful, full-bodied, and beautiful, this floret is the life of the party. Over-bursting with endless layers of petals, they have a lot of movement with ruffled edges that are reminiscent of a flowing dress. It's vibrant watermelon color is youthful and adds quite a pop of color to any living space. They are bubbly and bright. Bring this gorgeous bloom for a a scrumptiously festive experience. One of their outstanding qualities is a strong resistance to warm weather, making them perfect for outdoor parties. They are to be missed at grand celebrations with their unreal double bloom and rich carmine layers. Unlike some other varieties, the Peonies Flowers does not have a fading-quality in the petals but is rather uniform in color distribution. Say something loud with this spectacular blossom that can morph itself into any situation and fit perfectly whether it to be a birthday, themed party, or an elegant event. Just be sure to get the effect you are looking for because these florets can easily steal the show! Of course, they pair beautifully with a variety of other blossoms to create gorgeous arrangements. 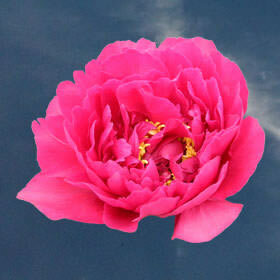 Kansas Peonies are also rather fragrant and hence our powerful in every floral sense. One could imagine that this was the kind of bud that would have satisfied the Queen of Heart's insatiable standards in Alice in Wonderland. Yes, theese florals are a pure fantasy. Grown in Alaska, we take great care of our peonies in order to ensure they have that famous double bloom that gives them such a miraculous presence. We expect excellence from ourselves and so can you expect the same. Shipped directly to you via FedEx or UPS, these products are fresh!